That’s all. Don’t even act surprised, because it’s pretty much a scientific fact that you can make anything taste good if you wrap it in bacon, cook it in bacon grease, or sprinkle some bacon crumbles on top. Dry chicken? Check. Marginally too-healthy salad? Check? Sticks that you picked up off the ground in the back yard? Check. Anything, people. So the other night, I come home, open the fridge, and all I see if this huge package of tilapia staring at me. It seemed like a good idea at the time, but when you’re in the mood for something delicious and exciting, tilapia isn’t exactly it. No offense to the poor little fishy who gave his life for the sake of my dinner, but… gosh, I bored even sitting here writing about the tilapia. Don’t get me wrong, we have it for dinner a lot. It’s easy and you can do pretty much anything with it. And it’s a step above boneless skinless chicken breasts, anyway. But I wasn’t about to pan fry another tilapia filet, and I couldn’t find any bacon in my deli drawer. (For those of you who know me, you know this is strange. Very, very strange.) But I had some prosciutto. Hmmm, promising. Oh, and some sage left over from these guys. Aha! Tilapia Saltimboca. So I took two filets out of the package, threw the rest in the freezer, and hopped to it. Truth be told, I wasn’t really expecting this to be as awesome as it was. I kind of thought it would make my boring fish a little less boring and we could go to bed with full, happy bellies. But then… it was good. Really, really good! Who knew? 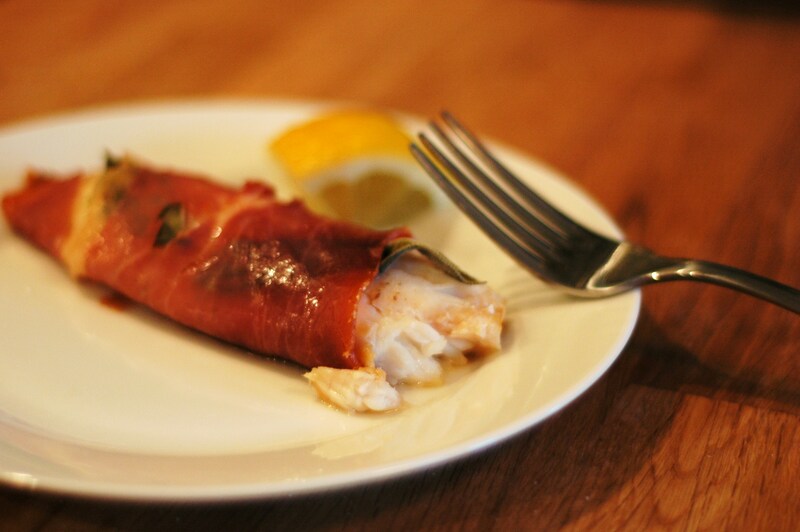 I’m talking so good that I’d actually go out and buy boring fish to make this again. Wrapping the fish in prosciutto kept the fish moist and flaky, and kind of infused the flesh of the fish with it’s salty, porky flavor. The little bit of sage I tucked in was the perfect fresh counterbalance for all that salty, meaty goodness. And did I mention how insanely easy this was? A star is born, folks. Preheat the oven to 425 degrees Fahrenheit. Prepare a 8×8 baking dish with a little olive oil or cooking spray. 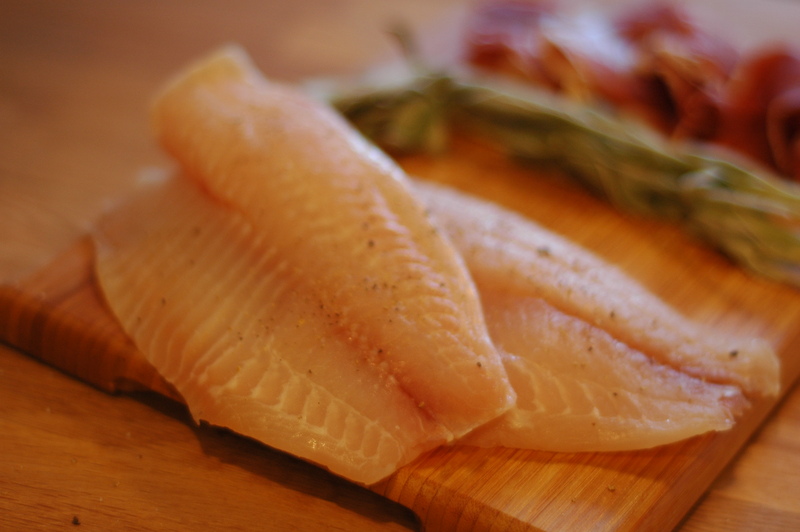 Begin by cutting each tilapia filet lengthwise, down the natural center. Don’t worry too much if one half is a little larger than the other. Season each piece of fish with salt and pepper. Take each piece and place 2-3 sage leaves on top, depending on the size of the filet and your affinity for sage. 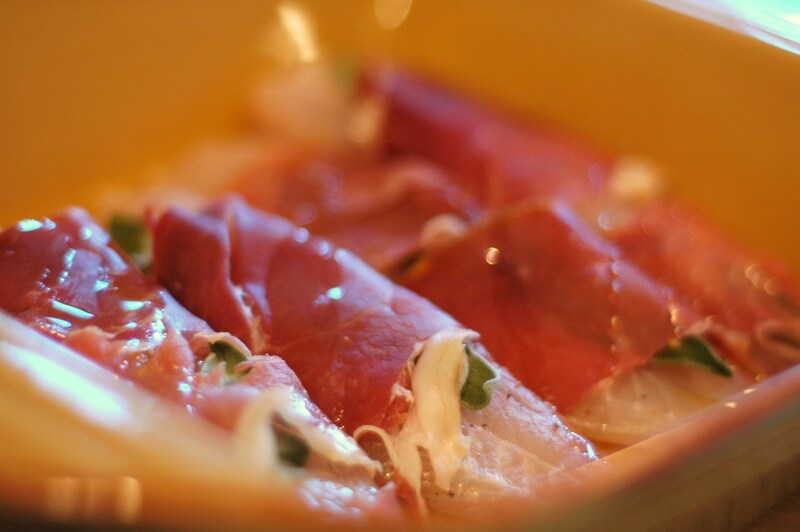 Then, gently take a piece of prosciutto and wrap it around the filet. Don’t worry if it doesn’t wrap all the way around or it won’t stay wrapped. 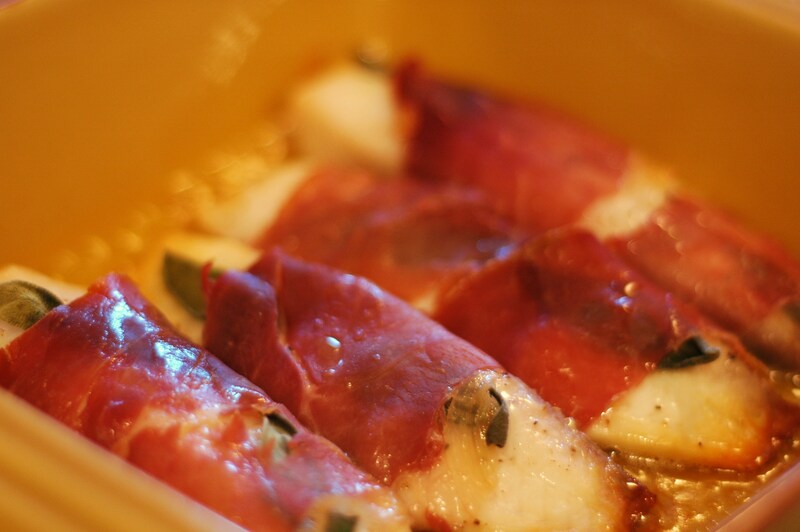 Put it in the dish, and tuck in the prosciutto around the bottom if it’s not behaving. Drizzle the olive oil over the top. Bake for about 12-14 minutes in the 425 degree oven, or until the fish is opaque and firm to the touch. You can serve it with a squeeze of lemon if you want, but it really doesn’t need much. If you just really feel like you need some sauce for this, I’d brown up a little butter in a pan with some sage, if you have any leftover. Let me know how it is. Since I will be making this again soon. “Marginally too-healthy salad? Check? Sticks that you picked up off the ground in the back yard? Check.” HAHA, that cracked me up! I am all for your logic of wrapping anything decidedly not-so-tasty in bacon to kick it up a notch, though. I approve (though my waistline doesn’t)! 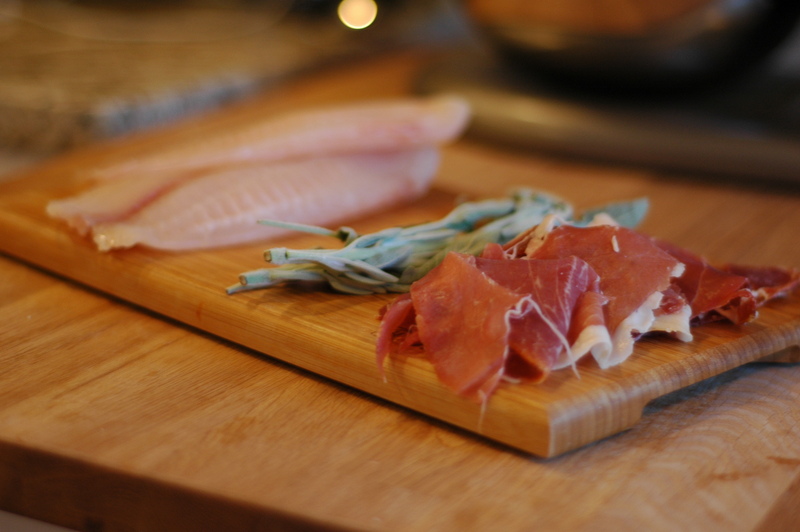 This looks amazing, and I can imagine that lovely prosciutto giving the tilapia a much-needed salt punch. Mmmmm… I may just make this tomorrow! Go for it- it won’t disappoint! I justify this dish as healthy, because it is fish, after all, and you use so little prosciutto that it hardly counts calorie-wise. 🙂 If you try it, let me know how it turns out for you!